When Mama comes home on a rainy night asking Ally and her grandmother to join her in an excursion, the two are not impressed. They don't really like the rainy, wet conditions and can't think of a good reason for being out in it. Mama assures them they are in for a big surprise if the accompany her. Reluctantly, they agree. As they walk Mama encourages them to take the time to enjoy what there is to see. that people jump back from the curb." They are not yet surprised; both are becoming impatient. Mama is certain they are going to love what is coming. They continue to take note of the many wet and wonderful things there are to see. Suddenly, they become aware of a different sound, one they do not hear every day. Can this be the surprise? they head to the water to mate and lay their eggs." The trouble is that the pond is on the other side of the road from where they make their homes for the rest of the year. The toads need help to make it safely to that pond. Many concerned people are there to help, including Mama, Ally and Grandma. Once they have helped the toads cross the busy road, they are ready to head back home, happy to have been of help when they were needed. Sandra Markle is a prolific writer whose work informs and inspires. 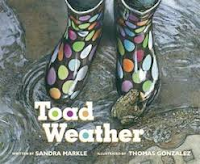 She lets her audience know - in an author's note - that toad migration is a real event and that helpers are needed to ensure that the toads are protected as they search for a breeding ground. Thomas Gonzalez uses pastels and colored pencils to create warm images of a family on a mission, and their rain-soaked neighborhood. He ensures that we always know where Ally is by looking for her beautiful polka-dot rain boots. Infusing light into the images he creates, we experience the warm glow of the family's shared experience and bask in the wonder of community. "Soon more cats came to Miss Hazeltine's home. And more. And more. So many arrived that on a Monday at five o'clock, when everyone but Crumb was fast asleep, Miss Hazeltine ran out of milk. "I'm off to fetch a bucketful," she told Crumb, "and will be back before dark." Crumb watched her go. But by the time Miss Hazeltine rounded the road back home, the sun had set." Miss Hazeltine has a love affair with cats. Because of that love, she becomes a heroine of the best kind. She opens her home to cats who are abandoned, or lost, or in need of a safe place to prosper. In the beginning she wonders if there will be any cats needing her help. To her great surprise there are many ... and they have their share of fears and timidity. Crumb is the shyest of the bunch. Miss Hazeltine has great understanding for each of their foibles and wants only to help them be their best selves. Lessons are taught to build their confidence, especially when faced with the broom, or how to deal with birds. "Miss Hazeltine began her lessons at once. In the morning, she taught Bird Basics. At night was Scary Noises." She is not reticent to share her own fears: mushrooms, owls, and the dark. Although unafraid of the dark, Crumb worries that he will never be brave. So, when Miss Hazeltine goes for the milk and gets into some trouble, who do you think helps her and brings her home safely? "At Crumb's meow, the cats stared down the mushrooms. They purred to drown out the owl's hoots. And they pounced to be sure nothing lurked in the dark. Birgitta Sif, as she has done in every one of her other books, brings these characters to glorious life. She gives them such expression and vulnerability. Her richly detailed artwork is fresh and full of charm. White space allows readers to focus on the way that her lively illustrations match Alicia Potter's appealing text, and vibrate with personality and comfort. There is so much to see and appreciate about her interpretation of this winsome story. Who will get it out? Oh, my gosh! 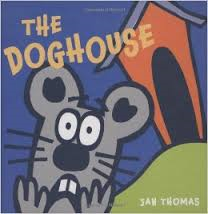 If you have little ones and you have not yet shared books by Jan Thomas with them, you are missing a tremendous treat! You may have met these friends before ... Pig, Duck, Mouse and Cow. If not, check your local library or book store for A Birthday for Cow (2008). They are sure to entertain and make you laugh. It's perfect for your birthday book collection. In this new adventure, Cow is obviously at fault when their bright red ball is kicked straight into the doghouse. YIKES! They are all terrified at the prospect of being brave enough to retrieve it. With a lot of prodding by Mouse, Cow moves forward. When she doesn't come back, Mouse is quick to suggest that there are many reasons for Pig to go next. Duck does not come back. Now, Mouse is all alone! When Mouse quietly wonders if Duck can come out, Dog's answer terrifies him further and Mouse flees. The surprise ending is the icing on the cake for this sure-to-please tale of friendship and misunderstanding. Using repetition, bold colors, expressive faces and a funny premise, Jan Thomas assures that young readers will love her story and want to read it repeatedly to anyone who will listen. 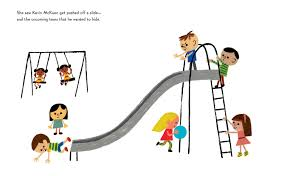 Interactive board books for little ones can be so much fun! The writers at DK Publishing tend to find that fun, and present it in colorful, captivating ways. In this book about colors, parents are encouraged to read with their children. 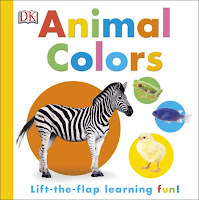 While doing so, they will help them to see and remember colors, as well as a wide ranging group of animals using a question and answer style. The format for each double page spread is the same: four questions with four colors/patterns, and a guessing game concerning the animal being described. I make the milk you drink. 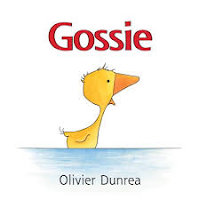 Fun to read while providing new information and reinforcing what they already know, this book will hold attention and provide a game-like learning experience for little ones. A final larger, colorful flap offers a look at additional animals and birds while encouraging more active participation, a search and find game and a page which allows for color memory are all found in backmatter. The clear photographs and additional illustrations help young readers with recognition. There is lots to learn here! "But it wasn't a baby growing inside her. It was cancer. It had started in her ovaries, and by the time they caught it, it had spread. She died a year and three months later. Now I'm thirteen, and I still miss her like crazy, because she was a quality human being. 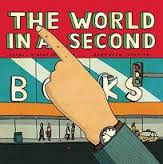 When I was seven, my day and I bought her a mug for her birthday that read WORLD'S BEST MOM ... "
I tore through this book in an evening this past week. I have great admiration for Susin Nielsen's writing and have read each of her worthwhile and thoughtful books. She does not disappoint here. 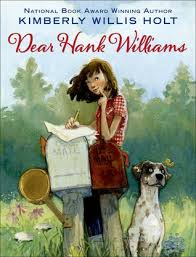 Her stories of compassion and understanding are perfect for adolescent readers. Life has not been great for thirteen-year-old Stewart and his family. His mother's death, after battling cancer, has left he and his father feeling vulnerable and alone. He's happy that his father has found someone else to love; he and Stewart are moving in with Caroline and her fourteen-year-old daughter Ashley. No two adolescents could be more different than they are. Stewart is an academically gifted and socially awkward boy who must leave the small school that has protected and encouraged his learning and individuality. Ashley is not smart, very popular, and consumed by everything Ashley. She has no intention of making life easy for Stewart. My, what a setting for a book that will make readers laugh, be horrified, and find much to admire about both Stewart and Ashley. Stewart is easy to love; Ashley takes time. Both are worth knowing, and certain to be memorable. Told in alternating voices, we are acutely aware of the difficulties each is encountering as they forge a new way of living. Alistair and I had an awesome morning. First, we spent a long time in the basement, working on my bicycle. This is a pet project of mine; a few months ago I bought a used ten-speed for just sixty dollars, and I'm converting it into an electric bike. I'm trying to do the entire conversion for under one hundred dollars, which is a challenge, but doable." Can my life just be normal for twenty-four hours without one of my family members ruining everything? Is that too much to ask? Lauren and I had a great sleepover. We played music really loud and sang along. We also experimented with makeup. When we were done, we voted on whose makeup job looked best and I won. Then we went to Facebook, and Lauren showed me Jared's home page, because she is 'friends' with him. "Did he friend you?" I asked. "No, I friended him," she replied, which made me feel better." So authentic and memorable, humorous and honest. They are two classic characters who will wend their way into your heart. The focus is on family in its many guises, and is heartwarming and believable. It is also emotional and powerfully captured by a truly accomplished writer. Adolescent readers are sure to see themselves in the hallways of Borden Secondary. 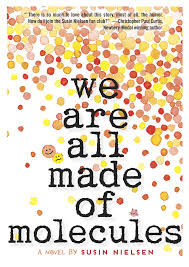 Finding ways to change the culture that is rampant in so many schools is a compelling read, and the ending is hopeful and encouraging - we are, after all is said and done, all made of molecules. Family life, in this new normal, is not easy to navigate for anyone involved. How each member of the blended family manages to deal with the changes is the stuff of great books. Gus wanders to the pond. He pokes his head underwater. Gus quietly watches the turtle ..."
The newest in Olivier Dunrea's simply wonderful tales of tiny, soulful characters that melt hearts tells readers about Gus and his exploring. Gus is a loner, and happy to be one. His observation skills are keen, helping him make special discoveries along the way! Not much escapes him. So, it is not surprising when he becomes engrossed in the doings of a small turtle. He watches the dirt scraping, the return to the water. Only then does he let his inquisitive nature allow a closer look. he pokes at the dirt with care, only to discover a trio of small eggs. His kindness kicks in. We watch as he gives all he has to protecting the tiny treasures. Only when there is movement does he leave his post. 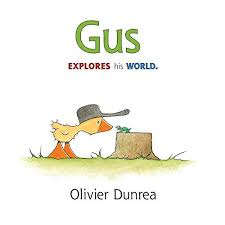 The hatchlings are welcome in Gus' erstwhile solitary life. Lovely, soft gouache colors and a deft touch with pen and ink assure the pleasure we feel in meeting Gus again. I am going to love sharing this with my granddaughter who arrives TODAY! 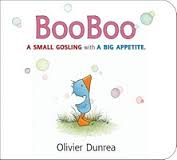 She will meet BooBoo and Gossie as well in new board book editions. 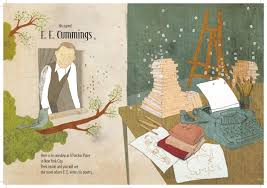 In another exceptional picture book biography we learn about E. E. Cummings. While I certainly know much of his poetry, I had no idea about his life. After reading this informative and appealing book, I have a much greater understanding for his work. Edward Estlin Cummings was born in the late nineteenth century into a household that included his parents, his sister, his grandparents, two aunts, an uncle, a maid, a handyman and sundry pets. It was a happy and encouraging place to be. In fact, E.E. spoke his first poetry at three; his mother wrote down everything he said in a book she called 'Estlin's Original Poems'. He enjoyed art; but, his passion was words. He liked to create his own or use familiar words and put them together to make new ones. Because this book deals mostly with his young life, the intended audience will find much to appreciate about his approach to writing. He worked very hard to be good at it, often spending contemplative time in the outdoors where he could carefully consider that world. Imagination led to artwork that showed his love for elephants, trees, birds - but, words were his forte. With lasting encouragement from his family and teachers, he explored the power of words. to live the life he imagined." After college he moved to New York, a city filled with inspiration for a young poet. His service in WWI ended with his return home, and the publication of his first books. They were not well received. Here was someone who was writing in a way that no one else was; it was inspirational and alarming to critics. He became E. E, changing the face of poetry and experimenting with form and lettering. He would let nothing deter him - his poetry was true to his vision and to 'saying YES'. Back matter includes a chronology of his life and work, a set of his poems, and a very informative author's note. Kris Di Giacomo fills the pages with the most inventive artwork. Letters and words dance across the textured spreads. Using mixed media and collage, she plays with words as Mr. Cummings did. There is so much to love and admire about the early life he lead. That is captured clearly in scenes of imaginary play, the idyllic surroundings he called home, and the constant, uplifting support that was essential to his success. 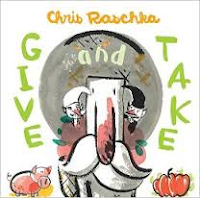 In a modern take on the folk tale tradition, Chris Raschka encourages contemplation of the concepts of 'taking' and 'giving'. It will be interesting to listen in on the conversation that follows sharing it with its intended audience. I would like to be a fly on the wall as young readers allow a look at its impact on their thinking. On the first day, an apple farmer meets an odd little man in his orchards as he inspects his apples for readiness. The elflike man is called Take and that is what he connives to have the farmer do -take everything he can! He promises a fine life. The farmer argues that his life is already fine; he allows himself to be talked into taking pumpkins from his neighbor - all of them! That is, however, not all he takes. Though weary when he arrives home, he uses the pumpkins to make soup which neither he nor his dog like. What he wants is an apple. After putting the boots to Take the following day, he returns to his orchard to harvest his fruit. There, he meets another odd man, called Give. Give promises a sweet life. The farmer is content with his life; again, he takes advice from Give. When he visits the pig farmer who is also his neighbor, he is encouraged to give all of his apples for the pigs. That is not, however, all he gives. This time when he arrives home tired and hungry, he has nothing to eat. Give gets the boot the next morning. While picking more apples, he hears Give and Take in an argument about who is right. Their altercation has the farmer thinking much more clearly. His solution to the problem created by taking unwanted advice is sure to rally quiet discussion. Mr. Raschka uses his signature black outlines, and free flowing images to help tell his story. 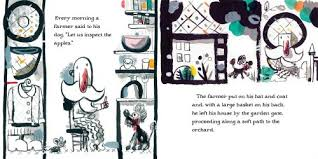 I love the farmer's red nose, his use of the color red throughout to draw our eyes to the importance of certain images, the abundance of produce, and the clever details used to keep readers engaged throughout the telling. It makes me wonder again ... when is enough enough? "Pixie Dust is what we use on throw up. It's pink and very absorbent. I sprinkle some on the bits of upchucked hot dog, Oopah Loopah, and Ambrosia Punch, sweep it into my pan, the deposit the now semi-solid pinkish patty through the mouth of a clown-head garbage can. A skinny, goofy-looking teenager wanders over ... "
Lane Smith makes a stellar middle school novel debut in this tale of Augie Hobble. It's a bit offbeat, to say the least, while also keeping its audience always moving forward and cheering for Augie. Fairy Tale Place is as zany as the story itself. Poor Augie is embarrassed by some of the attractions, feeling there is nothing attractive about them. It's his summer job; he works for his father, he is stuck with the daily grind. As well, he is trying to come to grips with attending summer school in order to bring up his Creative Arts grade, while fending off his nemesis Hogg Wills, and impressing Julilana, a girl from school who is hosting in the park as Cinderella. The bright light in his days is his best friend Britt. Together, they are trying to build a tree house which proves a tough task. They spend all of their free time together, and have a strong and loyal relationship. It all begins as one might expect. Lane Smith does not keep it going in a straight line. As happens in the amusement park where much of his story is set, Augie's summer becomes a series of twists and turns that will surprise and shock readers. But, it will keep them reading and relishing the art of the storytelling. Just when the reader feels comfortable with the trajectory of the story, Mr. Smith throws a wrench in it. Everything goes sideways as we read about pets that go missing, a death, visions, werewolves, thievery ... the list goes on. Augie is a character to love. He loves puns, is smart as a whip, funny, full of life and meets the overwhelming odds he faces as he navigates this harrowing with strength and humor when needed. 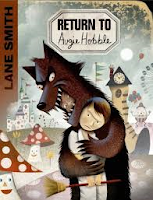 Like being on a roller coaster ride in an amusement park, Lane Smith manages to keep us on the edge of our seats as we head toward the fitting conclusion. The variety in the illustrations that accompany his tale is evidence of his humor and his artistic skill. He creates Polaroid-like images to detail events in Augie's life, as well as notebook pages that show Augie's lack of progress in getting his creative arts project completed. Every one of them is a joy to read, and will be much appreciated by kid readers. From zany to disastrous, then ultimately hopeful, readers will savor this ride. could make someone cower ... "
She may be the smallest girl. She may even be the quietest. She surely is the most observant of all that is going on around her. Whether she is on the school playground, in the hallways at school, or in the bigger world, Sally takes note of every situation, little or big. With heavy heart she sees that many of the events are hurtful. When she can take it no longer, Sally McCabe takes action. “I’m tired of seeing this terrible stuff. It turns out that she is not the only one. Her willingness to step up and say something is all the incentive others need to step forward themselves and join ranks with Sally. Together, they can be change agents for what happens in their world. that Sally has been paying super extra special attention. by the smallest girl in the smallest grade." All is takes is ONE! To say I am a huge fan of Christian Robinson's artwork is an understatement. Using colored pencils, he creates diversity in the children who people his action-filled spreads. 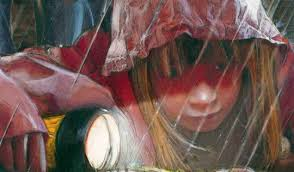 Children who are as observant as Sally is will note the playground scuffles, the whispered teasing, the joy that comes when the hurting stops. This book, with its message of empathy and understanding, and its charming and telling artwork, is sure to spark needed conversation in all school classrooms. We wish you were here." The parent elephants are longing for a baby to make their 'wish' come true. They speak directly to the child who finally arrives, assuring that child of their boundless love, their wish fulfilled. It is a story that will ring true in many families where desire to have a family is a long and often arduous journey to a hopeful and happy ending. 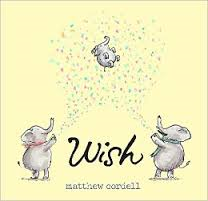 Filled with the honest emotion that comes from personal experience, Matthew Cordell has penned and illustrated a story of wanting and waiting, of hopeful longing and unrelenting sadness until the joy felt with the arrival of 'you'. Mr. Cordell draws his characters and scenes with delicacy, in keeping with his heartfelt tale. Using bamboo pen and India ink with watercolor paints, he places his characters at the seaside. Pastel polka dots establish the action of wishing and keep the tone light when it needs to be for his young audience. The design is detailed, emotional and honest. Family is the focus, and children are at the heart of it. "One by one the new owners claim their bicycles. Alisetta locks her eyes on Big Red, hoping no one else will wheel it away. Finally, her grandmother's name is called. Only a few bicycles remain. Big Red leans against the container. Alisetta rushes over to it. "This one!" she says. In the bush taxi on the way back to their village, Alisetta worries ... "
Alisetta's worry is that she has never ridden a bicycle. I remember that feeling all too clearly. We did not have money for a bike; our neighbors did. Dianne was willing to let me ride her bike around the block - if I knew how to do it. How hard could it be, I wondered. Pretty darned hard I found out, after I ran into the tree in their front yard and put myself out of commission for a few days. Had it been my bike, I hope that I would have done exactly what Leo does when he outgrows Big Red. He had saved his money to get it, and had loved it for the time he had it. He wants someone to have it who will love it as he has. When looking for a new bike, the owner of the cycle shop tells him how urgently bikes are needed in Africa to help villagers get from place to place. Leo is happy to donate to a group that will ensure it makes its way to those in need. 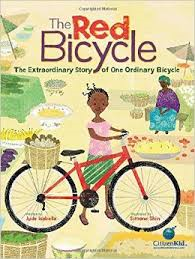 Big Red then finds new purpose in life when it is given to Alisetta, who uses it to help with the work on the family farm. Cars have little use on the dirt roads in Burkina Faso, but bicycles can make a huge difference to everyday life. Alisetta can get to the fields easily, and can even take the family's goods to market. When it is in need of repairs and can no longer be used by Alisetta, it is fixed up to become an ambulance for a travelling nurse. In it, Haridata can carry patients to find medical assistance at her clinic. Big Red has many uses and is much appreciated by those who are lucky enough to ride it. Digitally created, textured artwork allows readers to see the landscape of the African nation, the people who live there and their way of life. In backmatter, the author suggests that we all might find ourselves contributing what we no longer need to help others. It is a worthy suggestion for each of us to consider. It is important for each of us to know that we can make a difference ... one small act of kindness and generosity can impact lives. 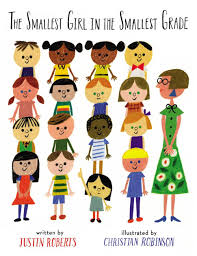 The CitizenKid series from Kids Can shows readers that they have a valuable role to play in changing the world. lucky blue boots ... "
Take a favorite author, add an equally favorite illustrator and you get a smartly constructed case of stage fright. The young narrator is full of confidence and ready to take on the world when he awakens the morning of the class talent show. He has done everything he can to prepare: he practices at every conceivable opportunity, sings it time and again without error, and he is wearing his lucky blue boot and cool pocket pants. No worry! I was ready to song my sing. plus I was wearing my lucky blue pants and my boots with cool pockets. There were no other kids left to go. so I stood in class of our front. And then I sat down." Have you been there? Haven't we all? It is not an easy thing to do. In the end, he succeeds in singing his song, two boys boo and the rest of the class cheers. Ah, sweet success! Judith Viorst tells her story in cumulative text, with characteristic humor and understanding. Sophie Blackall cleverly uses flaps and changes the way the boy looks to match the confusion he feels in telling his story. Keeping their eyes on the audience, astute observers are sure to see how the teacher handles little distractions and keeps the two impish, booing boys in check. Keep this book in your repertoire for those days when an assembly performance is in the works! is a playground of leaves. mountain of leaves. Come play!" As a child, I am not sure that I appreciated fables read to me. I probably was aware that they were meant to teach me a lesson ... and that is true! 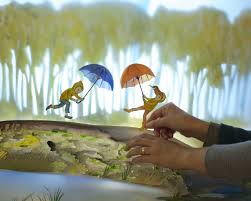 Often, children are not as keen to pay attention to a 'moral' as they are to be entertained by a well-told story. 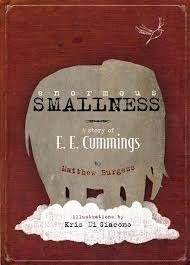 That being said, fables do have an important place in the field of literature for children. 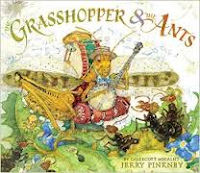 In the past few years, Jerry Pinkney may have changed the perception for shrewd sharers of his truly wonderful stories. As he did in The Lion and the Mouse (2010) and The Tortoise and the Hare (2013), he has created a most beautiful depiction of the age-old story about getting your work done before you take the time to play. The endpapers have enough visual detail to keep 'readers' focused and chatting for long minutes. There are many comparisons to make. The ants are as busy as they can be, and we are wise to all of their movements. Our eyes are in constant motion as we meet Grasshopper and the worker ants he is addressing. "It's spring and time to go fishing." No time, indeed. From an ant's eye view, we watch every movement and each small task meant to make life easier for the colony as winter approaches. Each season for the ants is spent in intense preparation, while Grasshopper makes music and ponders the need for so much hard work. The joys of the seasons inspire him to play and sing, and pay no mind to the fact that winter is just around the corner. Once the Ants have retreated to the warmth of their winter nest, Grasshopper becomes increasingly lonely and cold. When he begs for shelter, the Ants turn him away. 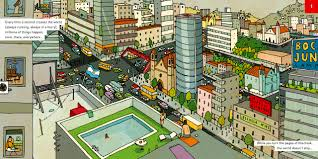 In an elegantly designed gatefold, it is obvious to readers that life in the colony is homey and cheerful. 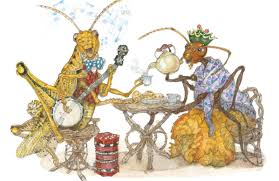 Their comfort is foreign to the Grasshopper who sits on his drum with his banjo providing a small bit of protection from the wintry cold. It is the Queen who offers a dramatic rescue. Tea warms Grasshopper's heart, and his body. The final double page spread is sure to evince many happy 'ahhhs' from everyone concerned. This is visual storytelling in the best sense of the word - not surprising when Jerry Pinkney is at work! His Artist's Note is personal and informative for his audience. It is a call to get outside and take note of the beauty to be found there. Brilliant in design, inspiring in his execution of the insects that are at the heart of the telling, and full of expression and life, it is definitely destined for my "10" shelf! Woodpeckers play their part in spreading seeds for new trees to grow, lay eggs and provide tender care until the fledglings are ready to make their own way in the world. Soon, summer has passed and winter approaches. They leave their old nest to find a new one, providing shelter for whatever bird or small animal decides to sublet. Children will learn as they go. 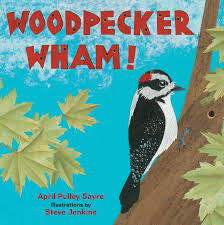 Further to the lyrical text and onomatopoeic noises that make these very unique birds recognizable, there are six pages of research notes that help to give readers an abundance of further facts that they will find interesting to their study of the six woodpecker species included here. 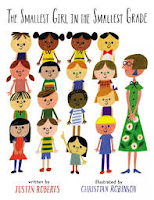 It assures that this book meant for young readers has everything needed for older readers and adults as well. What else can I say, that has not already been said, about the incredible cut paper collages that Steve Jenkins fashions to accompany Ms. Sayre's text? They are lovely, exquisite, intricate and oh, so perfect! His sky-filled backgrounds change as the day passes. His birds are so textural you feel sure you can reach out to touch them; each small detail adds to the beauty of the whole. While some people find woodpeckers and their noise annoying, I will admit that I can hardly wait to hear and see them as spring turns to summer. Right now I am visiting my friends in Ohio, and watch a woodpecker out my bedroom window every morning. As long as he is not boring into the wood siding on the house, I am allowed to enjoy his industriousness. Please make sure that this fine book is placed next to Eat Like A Bear, 2013 on your child's library shelf. It is a worthy addition. "When Rudy first starting driving the convertible, Frog couldn't resist the chance to try and beat him. He'd wait on his bicycle at the end of our driveway, and when he heard Rudy's engine he'd place his right foot on the right pedal and rise on his toes on his left. When he heard Rudy approaching, Frog's back straightened. Seconds before Rudy reached him ..."
I have a special spot in my heart for books written as letters! When those letters are written by a girl who tugs at heartstrings, it just adds to the enjoyment of time spent reading her story. I love Tate P. Ellerbee: her voice, her love of family and dogs, her need to be truthful, her dreams and her positive look at life. 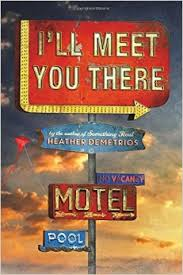 An assignment on the first day of school sets Tate on a path to find a pen pal. Her teacher suggests that the students might want to write to children in Japan; she also offers the option of picking their own. Tate chooses Hank Williams, a brand new recording artist whose music she loves. In frequent letters she tells him all about life in Rippling Creek, Louisiana. She fills her letters with stories of her parents who are no longer living with her, her aunt and uncle who have taken she and her little brother Frog to live with them, her neighbors, and classmates. In the beginning it is easier to tell lies about her parents' whereabouts. As she keeps writing, she finds herself sharing the hard-to-accept truth about them. Her father has disappeared, and her mother is in jail. There is one big thing she is not able to share, until she has garnered all the courage it will take to do so. Tate has dreams and she shares them freely with Hank Williams, despite the fact that she never hears a word from him, except to receive publicity photos that are automatically sent to his fans. 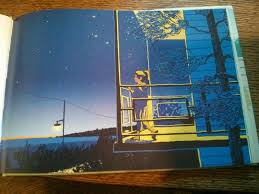 Undeterred, she continues with the letters from September through June, always hopeful that he will find the time to send her a note. It takes a lot to face all of the truths in her life, but she does so with loving support from Aunt Patty Cake and Uncle Jolly. Full of heart and compassion, powerfully written, honest and historical in nature, readers will appreciate the sensitivity with which Tate's story is told. "The Amazon has a staggering 1,100 tributaries ...Those rivers widen into thousands of lakes, and every year for months at a time the Amazon floods hundreds of kilometers of tropical forest. Sometimes the forests are drowned under 13 meters (43 feet) of water. South America sinks by 8 centimeters (3 inches) every year because of the extra weight ... "
If you watched the news concerning the floods in Texas and Oklahoma last month you will have some idea of the power that is possible when dealing with mighty rivers. In this book, Marilee Peters gives her readers a close look at some incredible stories concerning human history and the roles played by 10 rivers. The rivers considered are the Awash, Tigris and Euphrates, Nile, Rhine, Amazon, Zambezi, Thames, Mississippi, Ganges and Yangtze. Their stories are told with compelling text, archival and contemporary photographs, and outstanding original artworks. As you read you will be impressed and surprised by the influence that each of the rivers researched for this fine nonfiction book have had in the grand scheme of things in our world. "For Mao Zedong, the leader of China from 194 until the 1970s, the answer was simple: swim across the Yangtze, the country's biggest, strongest, most famous river. So that's what he did. When he arrived dripping and breathless on the far side, the whole country considered him a hero, and Mao was able to stay in power long enough to shape the future of China." Throughout the book, the author uses her storytelling ability and the plethora of information she gathered during her research to make her book compelling and memorable. She uses a historical character, makes a connection to a river and its impact. From a mother ape searching for food for her hungry babies caught in a flash flood and found three and a half million years later by paleoanthropologists, to Li Pang who helped Sun Yat-sen navigate the Yangtze to his new place in Chinese history, she entertains her readers with the power that rivers hold. 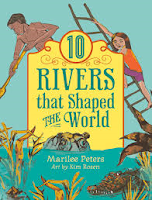 I was fully engaged in the reading start to finish; now, I know so much more than I ever thought I wanted or needed to know about rivers of the world, their influence and the roles they continue to play in all parts of the world. The design is striking, while also being entertaining and very accessible. A glossary, source list and index are welcome. What a terrific resource it is! "It seemed like a good time to visit his friend Gibson. Henry went to his bedroom to get dressed. As usual, his clothes had been laid out for the day. "I'd prefer something else," said Henry. Poor Henry! He's the baby of the family; it seems that everyone else wants to keep it that way. They do everything for him, including using language that even the youngest babies would not appreciate. "After breakfast, Mama swooped in low. "Let Mommy brush your widdle toofers." The rest of the family raced to the bathroom, elbowing and calling dibs. "Let me," cried Papa. "Let me!" shouted Mem. "Let me!" hollered Sven." Henry is tired of all the attention and coddling. Assuring all that he is perfectly capable of brushing his own teeth, getting dressed, going next door to his friend's house to play, pouring his milk, cutting his own bread and eating what is on his plate, he proves his mettle. Not being constantly concerned with Henry and his needs, the family members find time to participate in things they have been missing while spending all of their spare time caring for Henry. Everything changes when Henry gets ready for bed all by himself, and gets into bed all by himself. Maybe, just maybe, he can use some company! 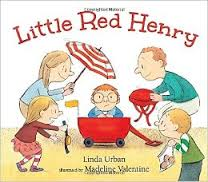 and snuggled and squeezed their little redheaded Henry. wished him sweet dreams and sang him a long lullaby ... "
Madeline Valentine creates small glimpses at a quiet and loving family as they interact with one another; then movement and expression as Henry and his friend Gibson spend a delightful day playing hard. The cartoon-like illustrations are a perfect accompaniment to Ms. Urban's energetic and playful text. Hang in there, Henry! Everywhere in the world something is happening at just this second. While I am writing this post, my granddaughter is eating breakfast, my brother is driving on the highway, my son is walking in the sunshine, and you are perhaps reading this description of a remarkably designed 'new to us' book. are clearly created to help readers understand the full impact of each of its more than twenty tales. So, when a boat is caught in a storm in the Baltic we seen the vast expanse that is that sea, the crashing waves, the tossed boat and the containers that are being washed overboard. The bold colors and designs are clearly delineated by black lines. The second-long events happen in world communities - one per spread. A world map and key show readers where those communities are and the time of the day for each one. Page numbers correspond to placement on the map and the time stamp. Readers are made aware of all that can happen in one split second. It is a most engaging premise. They are sure to finish their reading with compelling questions ... what happened to that boat from the Baltic? Thinking big, while also thinking small, it is both simple and complex. This is a book that will delight and open discussions. "On January 18, 1788, the first of 11 ships carrying 1,500 people arrived at Botany Bay, Australia. Most passengers were British convicts sentenced to "transportation" or exile, for crimes ranging from minor theft to murder. From 1793, free settlers, who chose to emigrate, also began to arrive in Australia." 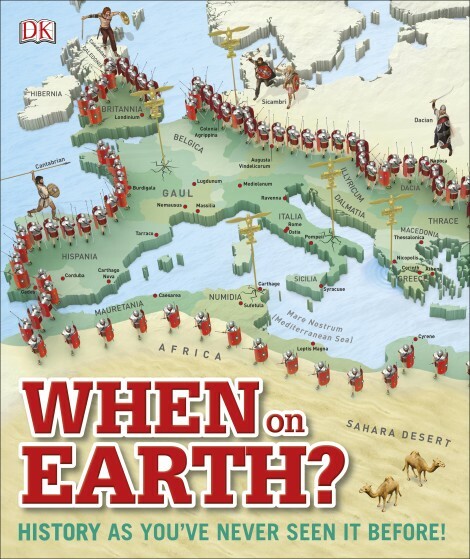 Here is another of those books that is sure to hold endless fascination for those interested in history, and how we got to where we are today. It will be on my coffee table for as long as it takes for me to discover every single facet of information that fills its pages. 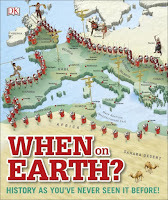 It is a worthy companion to Where On Earth (2013). "These figures are from the palace of the emperor of Persia. They are thought to show the emperor's bodyguards, known as "the Immortals". The guards seemed immortal because if one died, he was replaced before anyone noticed." Each turn of the page offers a small lesson in history. Captions, labels, maps, boxed keys to the mapping, fact boxes, timelines, photographs, clearly drawn illustrations, a short paragraph concerning the page's subject and a ticker tape that runs across the bottom had me paying full attention to the text on the page. Visually attractive, broad in perspective, and enlightening, this is a book that will find fans at every turn. It is well worth the time and attention that it is sure to garner. Impressive! Please don't forget to check DK's wonderful website: www.dkfindout.com!
" ... the afternoon sun reflects off our anchored sightseeing boat, 130 feet of aluminum scrubbed clean for the passengers that board every day. Before now, this wharf held sloops and schooners and whale boats." For this father-daughter team, who run a whale boat business, their days are filled with visitors excited about being on the sea, and with seeing whales. It is a family business that has been operating for generations. As she explains to us, the business of searching for whales on their sightseeing boat is vastly different from whaling in past generations. As we move forward through each pair of pages, we see a scene on the left from the business today (done in full color, detailed gouache and acrylic with pencil illustrations). It is faced on the right with a sepia-toned look at the past. 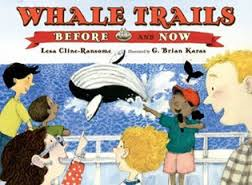 Life has changed dramatically through the years that our young narrator's family has been 'searching' for whales. Despite these immense changes, when the boat returns from their latest voyage the bay itself and the whales have remained essentially the same since their family business began operation. to put in the lost and found. for candles; and scrimshaw made from whale's teeth as loved ones waited on shore." People are endlessly fascinated by whales and spend millions of dollars every year to go out in boats to 'watch' these magnificent giants. Combining what has happened in the past with today's excursions, Lesa Cline-Ransome has created a book that children will find both intelligent and revealing. As it examines past practices and compares them with what is happening today, children can see how attitudes have changed towards creatures that live in the wild. I love the artwork created by G. Brian Karas that shows the two scenes side-by-side. They have quite the impact! It is easy to keep the time periods separate for young readers. The details he includes capture attention, invite questions and offer explanations. Historical and hopeful, this is a terrific book to share with children. An author's note is included in backmatter, as are a glossary and an invitation to seek out other books that offer further study.
" ... all came down to who Josh laughed with and who he laughed at. He was never cruel, not the kind of bully they warn you about in school assemblies. He was just the final answer to whether or not you belonged. Josh and I had never been what you'd call friends, but I'd worked with him at the Paradise since I was fourteen, and that counted for something." Creek View, California is a town you would rather be from, than living in. Skylar cannot wait for graduation and the chance to move to San Francisco where she will pursue her love of art. Josh Mitchell, a hometown 'hottie', has just returned from Afghanistan, missing a leg and dealing with the trauma of war and the loss of friends while there. The two work together part-time at the Paradise Motel. Sky's mother is in a spiral of alcohol abuse and without a job. Skylar spends a good deal of her time trying to keep her dream of leaving alive, all the while knowing she cannot leave her mother alone in her present state. Her attraction to Josh is evident, as is his to her. But, he is dealing with far more that he is willing to share. Highs are followed by lows for both, neither able to completely share their true feelings. Told well in both voices, the author pens a believable romance, meant to keep readers moving forward as they connect with these memorable young people. Secondary characters are well-drawn and add impact to the story. They support Sky as she tries to come to grips with her worry about her mother, her growing attraction to Josh, her angst when she feels that he is rejecting her. Both have much on their own plates; their own personal stories will have readers wondering what might happen to them all until the final page is read. Emotional and real, this is a book that has sadness and great joy. The descriptions of Creek View and the Paradise Motel allow a different perspective. Skylar and Josh are people to admire; you will harbor hope for their future. They are not without their flaws, but those flaws are what make them so real. We want to cheer them on, and hope that their courage and ability to overcome adversity will lead them a happier future. It is an important story to tell for its focus on the effects of war and poverty, and how lives are affected by both. "The dream was familiar. Though, Mama wasn't sitting on the slab of rock in the middle of the river. She sat cross-legged on the short, rocky beach, wings spread wide. The cranes were there on the bank, the way they had been the morning she died. She reached her hand out to me, but no matter how many steps I took, I couldn't get to her ... "
Grace hates the river. After an argument about moving, her mother went for a walk and didn't come back. Grace found her body by that river following an accidental drowning. Now, she has been sent to live with her maternal grandmother, a woman she has never really known. Grace is sure she can find a way back to the last home she and her mother shared with the Greenes - a place where they had been happy and loved. Grace and her mother could not find the perfect place, despite so many attempts. Grace wants a home - a permanent place to live after too many moves in her short life. She doesn't want it to be with her grandmother, despite all the signs that life could be good there. She has great integrity as does her grandmother. She just cannot see that, without bias. Her grandmother is also honest and full of regret for events of the past. As Grace follows clues that she is sure are being left by her mother, her grandmother shows an abundance of patience and understanding. While letting her granddaughter make decisions that are not necessarily the best ones, she wants Grace to find comfort with her. As Grace does her best to make her grandmother send her away, she shows readers how smart and perceptive she is. She is filled with sadness, as well. Only as time passes does Grace make new discoveries about her family; then, they are able to find a place of peace. 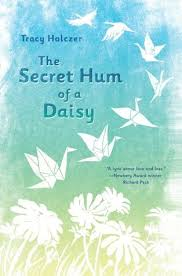 The story is told brilliantly; it is a stellar debut novel for Tracy Holczer. There are no simple answers or solutions to the situation Grace and her grandmother must accept. With hard work and a growing trust they are able to find balance in this new life that they will lead together. Tenderly told, and with great heart, readers will not soon forget these amazing characters. 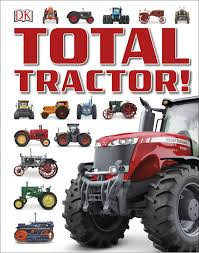 "Before tractors were invented we relied on steam engines for powering farm machinery and towing heavy loads. Steam engines remained popular until they were replaced by more efficient internal combustion engines - engines that work the same way as those you find in cars today." This is an informational text that will find fans in many classrooms. Its pages are filled with glorious full color photographs to guide young learners through the plethora of powerful machines that are being used today. There are three chapters, following a quick introduction - Powerful Machines, On the Farm and Beyond the Fields. Within each section, there are descriptions of each machine mentioned. They are accompanied by captions, labels and an additional fact box that often gives the dimensions and valuable information about production, origin, weight and total power. The variety seems endless, the history informative and attention grabbing. There are archival photos to help readers see how these powerful machines were used in the past. We are invited to see the details of the many tractors described, to get close up and personal with interior views, and take as much time as needed to discover the many amazing characteristics of so many. There is a lot to discover, readers will spend hours learning new 'stuff'! tread patterns are used for different kinds of work." 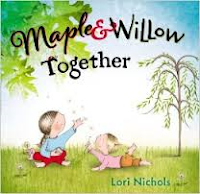 - 1 2 4 5 6 7 8 9"
I'm happy to see Willow growing up to be the little sister that Maple didn't know she was hoping for in Lori Nichols first book about them, (Maple, 2014). The two remain fast friends: enjoying each other's company, speaking their own language, building, catching and playing. Once again, Ms. Nichols' uses pencil on Mylar and digitally colors her charming depictions of sisterly love, keeping the maple and willow trees prominent in the backgrounds. 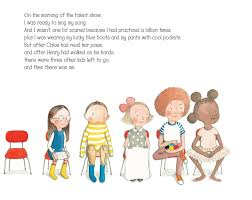 Her use of white space allows young readers to focus on the two girls, their activities, their expressions and the discoveries they make about growing up. It isn't until Willow has a problem with the order of numbers that Maple has a bit of a meltdown. If you have children you will understand, having been witness to such blips in the way their days go. It doesn't take much to turn the world upside down for them. "I'm in charge of the umbrella!" Because she was in charge of the puddles!" Days pass and the two agree to disagree ... until Willow takes a stand. Willow is 'admay!' and takes her anger out on Maple's toy. WORLD WAR III! That's it for both of them. For their parents, too. Time out is called and each is restricted to her own room. It is inevitable with siblings, isn't it? Left to their own devices and with alone time to think, the two come to an understanding. When a young miss from the country moves to the city, she finds that she misses a lot. Instead of cricket song, she hears train whistles. Instead of bird calls, she hears car horns. That is not the worst of it: her house looks just like all the others. There may be a saving grace; but, she has not yet spied one butterfly, the things she misses most of all. Right next door, there is a gate unlike any she has ever seen. 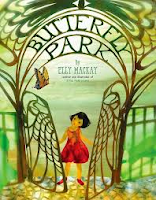 Looking closely, and with wonder, she sees that the letters above it spell Butterfly Park. What great good fortune that must be! Returning to the garden in the morning, with a plate of cookies in hand, she is sure that she will find the butterflies it promises. Not a one to be found - she waits and waits. Noticing a butterfly in the yard next door, she goes and knocks. A boy answers, agreeing to help her capture the butterfly. Once caught, they go off to release it in the park. It flies away. They follow the butterfly and see that it is attracted to flowers. Recognizing that they will need help to bring butterflies to the park, they are off on a search of the neighborhood to find willing volunteers. Capturing the beautiful beings is not the problem; rather, it is keeping them. What can they do? You will be inspired to see how the children of the town solve their problem, how the little girl takes matters into her own hands, and how the community rallies round her to make Butterfly Park the perfect name for her new neighborhood. Now, she can feel comfortably at home. Elly MacKay uses exquisite cut-paper artwork in glowing dioramas to set her story in the most remarkable space. As the community comes together, so do the images that will astonish readers and bring joy as they open the final gatefold that completes the book, fulfilling a young girl's dream. Adding to what is already a very special experience, the book cover opens into a poster that might motivate aspiring gardeners to plant their own butterfly garden, showing them those plants that butterflies find irresistible. That's why I like it." Our car rides in the summer were not to a motel that acted as home for a week of fun in the sun and sand. We didn't go every year. We did go often enough that I remember trips to Saskatchewan to spend time with relatives fondly. Our routines while there did not have the same predictable quality that the young girl narrator shares. Nonetheless, they were equally memorable for my brother and me. 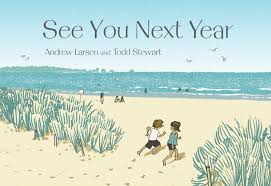 The young girl in Andrew Larsen's quietly comfortable tale tells readers about the annual trip she and her family take to the same place at the beach each year. "Every year we stay at the same place. I call it our cottage. But it's not really a cottage. The straightforward, memory-laden language offers a sense of peace; for me, it sparks special memories of long ago summers. I am sure it will do the same for the adults who share it with eager listeners. Each year's common events are chronicled page by page, one year the same as the next ... until this year. This year, she meets a new friend who encourages her to try diving under the waves, writing postcards, digging holes on the beach (hopefully, to the center of the earth, right?). Suddenly it's Saturday; the week at the beach has come to an end. Wait! A surprise arrives on Monday morning ... a reminder that there is always next year! This is a debut book for Todd Stewart, who was born in Saskatchewan, and now makes his home in Montreal. It will certainly not be the last we see of his beautiful artwork. While creating a nostalgic look at past summers, he infuses every page with light. From morning brightness to the shady cool of the 'Tall Pines' Motel, from bold heat on the daytime beach to the warm glow of a campfire, he allows us a realistic view of this memorable summer vacation. "Blackie wasn't born in the mines but he was still just a young pony when he and the other Shetlands on the Thomsons' farm were first walked to the coal mine. One by one the other ponies were fastened into a cage and lowered into the ground. Then it was Blackie's turn. He whinnied with fear and bucked and kicked, but the men spoke softly and kindly to him ..."
Kids who love horses love them passionately. You will know who they are. This is a book written for them. 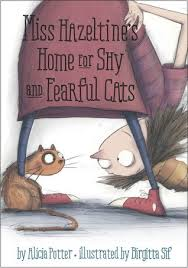 It will also capture the attention of other readers who like their nonfiction told in story form. Elizabeth MacLeod is a master researcher and a very adept storyteller. I was lucky enough to act as liaison during one of her trips to Manitoba. She is completely at home sharing her passion for writing, keen to chat about her interests in friendly conversation. So, it is no surprise that her books have that same congenial tone. In her new book, she introduces her audience to these much-loved equine companions that have changed life for many - for more than 5,000 years. "They gallop and whinny their way into our hearts, and capture our imagination - but they have also changed history. Horses have done more to transform civilization than any other animal. Horses are the only four-legged animal that has changed the way humans live, travel, fight, work, and play." Ms. MacLeod bookends her stories with two horses that will be recognized for their place in history. Beginning with Bucephalus, the black stallion that fascinated Alexander the Great from the moment he saw him, when he was only 12 years old. The horse made a fool of anyone who tried to ride him - until Alexander. Together for 18 years, the two fought valiant battles and it is surmised that the loyal horse died after keeping Alexander safe when he was in grave danger. Finally, she shares Seabiscuit's story. No one expected the 'runty little bay Thoroughbred' to amount to anything, despite his genetic history. But a highly successful trainer believed in him; it wasn't long until Seabiscuit was faster than any other horse in the western United States. The rest, they say, is history! The pages between the stories of these well-known horses allow a glimpse at the mustangs, the mail movers of the Pony Express, pit ponies, and Star, a horse hero of the Revolutionary War. Information boxes, contemporary and archival photos, captions, and artworks add interest and provide additional information for interested readers. If you know someone who loves horses, this is the perfect book for purchase. "Sybil's ride on April 26. 1777, changed history, and she couldn't have done it without Star. 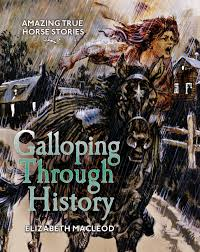 Without a horse to ride, Sybil would not have been able to muster her father's troops in time to fight the British." I will read this repeatedly to anyone who wants to listen! I love characters with personality and an authentic voice. Duck and Bear are neighbors and they couldn't be more different. is lit by a bright yellow light which casts a warm glow outward. The bigger house next door shows a soft blue light. Turn to the tale's first page ... Duck, bathed in bright light, is drinking coffee and reading a book called 101 Ways to Stay Awake. On the opposing side Bear, bleary-eyed and holding the railing that leads upstairs, is complaining about being exhausted. Duck is raring to go and wondering what Bear might be doing. 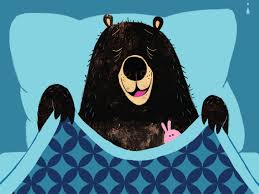 Bear is all tucked up and settling in for a long and glorious rest. Duck's pounding on the door and impatient calls bring Bear downstairs in his robe, worried that there is something wrong. Totally untrue. Of course, he does not. Duck is not to be deterred. From one suggestion to the next, he is impervious to Bear's negative reactions. Off he goes, and Bear settles back in bed ... not for long! Obviously, the two are not on the same page when it comes to sleep. Three interruptions and Bear is totally befuddled. 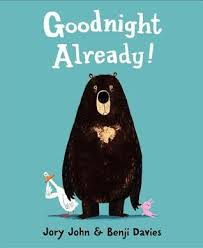 Not only is it a wondrous read aloud story for rapt listeners, Benji Davies captures attention with his brilliant compositions. He varies the way the pages look and gives his readers two expressive characters who will have them giggling throughout the reading. And, the twist at the end is just perfect! "My mom says that my consequences are staying all day in my room with no video games or watching stuff on TV, even though I'm thinking that video games and watching TV might help make my bellyache ..."
Oh, Alexander! It's so good to see you again. We have missed you. 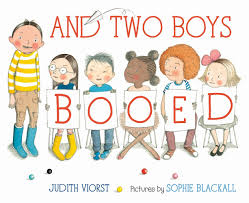 Judith Viorst and her wonderful family of 'characters' entertained us time and again when our kids were young. We read, then read again and again her books about Alexander and his family ... then, every other book she had written at the time. I have continued to read anything new even after my own kids were grown and gone. I read them to my students, to schoolchildren visiting the library, and to myself. So, it was with eager anticipation I opened this new book about one of my all-time favorite boys. Not much has changed. Somehow, Alexander has managed to devour a whole box of doughnuts. The consequences don't end with the bellyache he gets. No one is impressed. It's Saturday, so staying home from school is no big deal. His mother is threatening consequences after finding the empty box, his brothers are gloating ... and then, his mother follows through on her threat. much, much more than I love doughnuts." 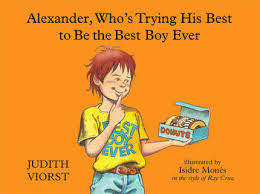 It marks a huge change for Alexander, who determines that he is going to be the best boy ever ... from now on! It's a tough row to hoe for a young boy who is more familiar with mischief than with manners. Every day is now full of thoughtful consideration of other family members, his teachers and fellow students, his soccer team, even his seat mate on the bus ride to school. Always in his head is what he might be doing rather than 'trying his best to be the best boy ever'. One night, when he and his brothers are bouncing on Alexander's bed and get caught, Alexander has second thoughts about his new life course. He has an epiphany about what the 'rest of his life' might look like; it doesn't warm his heart. In fact, the bellyache that comes from that realization may be worse than the one he had in the first place. Oh, what to do??? It is sooo good to have you back, Alexander! When I look at me." They go on to remind us that 'there's no such thing as little'. They follow that premise with proof positive that little is in the eye of the beholder. In a series of peep hole pages, they first ask a question concerning our assumptions for 'little'. Is a candle a little light? Peek through to the next page. You will see that little candle's light is the beacon on a lighthouse. We all know it is not a little light at all. Each turn of the page offers up another question about something that we can assume to be little. We are quickly shown that those assumptions could not be more wrong. Kids will love the peepholes, and the accessible text which will soon have them reading the book all on their own. 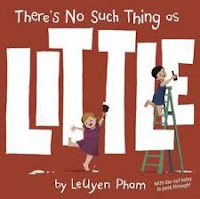 Carefully chosen language makes this a book full of fun, showing the reader just how much power little things can have. In each case, little is replaced by a stronger word that aptly describes the item much more clearly. The colors are bold, the design attractive and enticing, the message clear to the 'little' ones who are sure to share it repeatedly. Infinitely inviting for the young, and worthy of our attention. This is a book that begs to have a place on a child's personal library shelf.